The modern American diet is worlds away from the foods our ancestors ate. Even basic ingredients like rice, flour, fruits and vegetable are now processed, bleached and bred for taste and attractiveness rather than nutritional value. We neglect nutrient-packed options like farro, arugula and multicolored corn because they tend to be more bitter and tougher to cook. But these ancient dietary staples are making a comeback in modern recipes that combine flavor and nutrition. We consider the benefits and the industry behind these foods. Jo Robinson Author, "Eating on the Wild Side: The Missing Link to Optimum Health"
Maria Speck Author, "Ancient Grains for Modern Meals: Mediterranean Whole Grain Recipes for Barley, Farro, Kamut, Polenta, Wheat Berries, and More"
Combine the figs and the liqueur in a small bowl and set aside to plump for 15 minutes, stirring once or twice, while you prep the ingredients. Meanwhile, beat the yogurt with 2 tablespoons of the honey, 1 tablespoon of the orange zest, and the cinnamon in a large bowl until smooth. Stir in the wheat berries. Using a hand mixer at medium speed, whip the cream in a medium bowl until foamy. Add the remaining 2 tablespoons honey and continue whipping until soft peaks form. Drain the figs, reserving their juices. 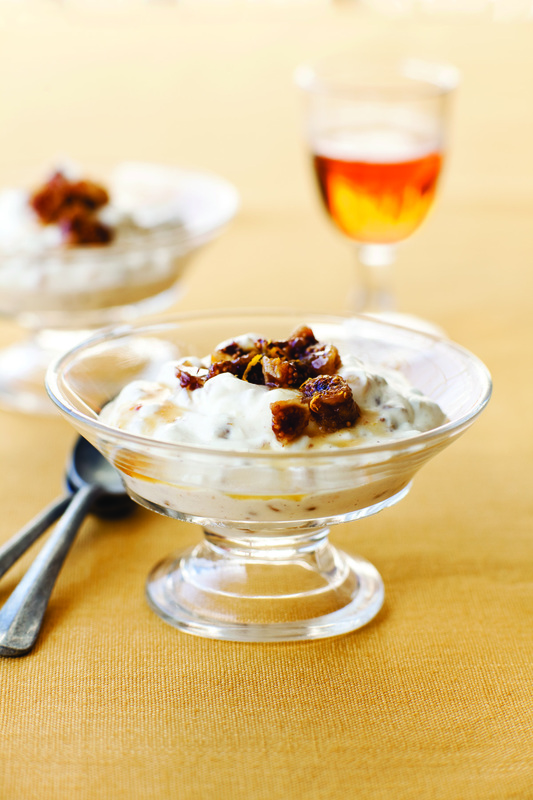 Combine 2 tablespoons of the figs with the remaining 1 teaspoon zest in a small bowl and set aside for garnish. Stir the remaining figs into the bowl with the yogurt mixture. Scrape one-third of the whipped cream on top and fold in using a spatula. Fold in the remaining whipped cream in 2 additions until just incorporated. Divide among serving bowls, cover with plastic wrap, and chill for 2 hours. To serve, top each bowl with a bit of the reserved figs and their juices. To get a head start: The dessert can be prepared up to 4 hours ahead. Add a dash more liqueur to the figs reserved for the garnish, if necessary. To lighten it up: You can use lowfat plain Greek yogurt, if you like. To make the quinoa, heat the olive oil in a medium saucepan over medium heat. Add the green onions (the oil might splatter!) and 1/4 teaspoon of the salt and cook, stirring frequently, until the dark green parts wilt but do not turn brown, about 2 minutes. Add the quinoa and cook, stirring occasionally, until the grains start to crackle and turn dry, about 3 minutes. Add the water, the currants, and the remaining 1/2 teaspoon salt; bring to a boil. Decrease the heat to maintain a simmer, cover, and cook until the water is absorbed, 15 to 20 minutes. Meanwhile, finely grate the zest of the lemon until you have 1 teaspoonful, and then squeeze the lemon until you have 2 tablespoons juice. To finish, remove the pan from the heat. Stir the zucchini, lemon juice and zest, 2 tablespoons of the sesame seeds, 2 tablespoons of the dill, and the pepper into the quinoa. Taste and adjust for salt and pepper. Cover and let sit for 3 minutes. Transfer the quinoa to a serving bowl, sprinkle with the remaining 2 tablespoons each of sesame seeds and dill, and serve. To vary it: For an Italian-inspired side, replace the sesame seeds with toasted pine nuts (see page 37), use chopped fresh basil instead of dill, and omit the lemon juice. To make the polenta crust, bring the broth and the water to a boil in a large heavy-bottomed saucepan over medium-high heat. Add the salt. Using a large whisk, slowly add the polenta in a thin stream, and continue whisking for 30 more seconds. Decrease the heat to low and cover. Cook for 10 minutes, stirring vigorously with a wooden spoon about every 2 minutes to keep the polenta from sticking to the bottom. Remove the saucepan from the heat and let sit, covered, for 10 minutes, stirring a few times. The polenta will be fairly stiff. Stir in the cheese, egg, and pepper. Grease a 10-inch ceramic tart pan with olive oil or coat with cooking spray, and place on a wire rack. Have ready a tall glass of cold water. Dip a wooden spoon into the water as needed as you spread the polenta mixture across the center of the pan, pushing it up the sides. Set aside to firm up at room temperature, about 15 minutes, and then form an even rim about 3/4 inch thick with your slightly moist fingers, pressing firmly. No need to fret over this—it’s easy. Meanwhile, position a rack in the center of the oven and preheat to 375°F. Prepare the artichoke cheese filling. Place the yogurt, eggs, green onions, parsley, rosemary, salt, and pepper in a 2-cup liquid measure or a medium bowl and combine well with a fork. 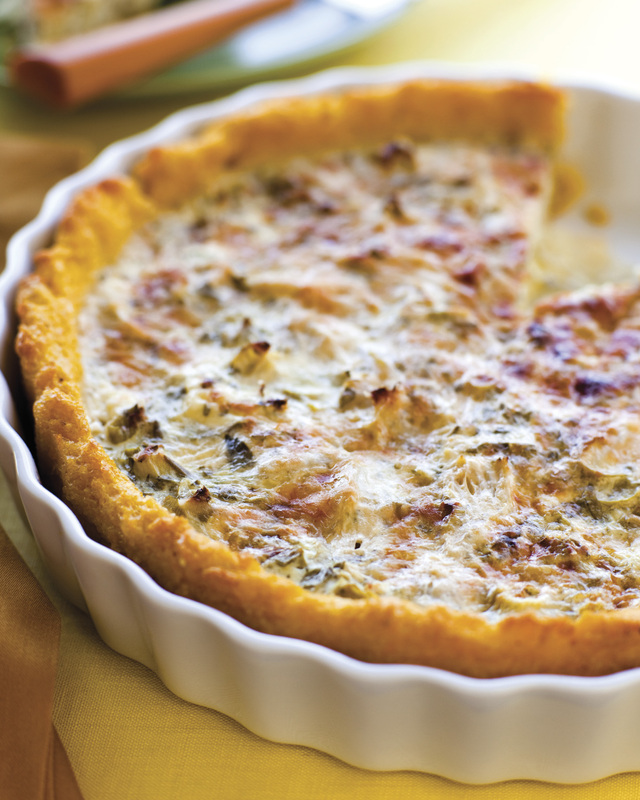 Distribute the artichoke quarters over the crust, cut sides up, forming a circle along the rim and filling the center (you might not need all the hearts). Sprinkle the goat cheese on top and gently pour the filling over the artichokes. Sprinkle with the Parmesan cheese. Bake the tart until the top turns golden brown and the filling is set, about 45 minutes. Transfer the pan to a wire rack and set aside at room temperature to firm up for at least 20 minutes, 40 if you can wait. Using a sharp serrated knife, cut into slices. Serve with more freshly ground pepper on top if you like. Reprinted with permission from “Ancient Grains for Modern Meals” by Maria Speck, copyright © 2011. Published by Ten Speed Press, a division of Random House, Inc. Photo credit: Sara Remington © 2011. Hearty lentil soup is a favorite of vegetarians and omnivores alike. The following recipe for “Armenian Lentil Soup” was first popularized by the book New Recipes from Moosewood Restaurant, published in 1987. Since that time, it has won thousands of fans. Dried apricots, eggplant, and cinnamon—three unexpected ingredients—give the soup a complex and exotic flavor. Search the Internet and you will find dozens of variations. The following version has been tweaked to give you the most nutritional benefits. The total prep and cooking time is just one hour. Make a double batch and freeze some for later. Press the garlic and set aside for 10 minutes. Rinse the lentils and put in a large pot with the broth. Bring to a boil, then cover and reduce the heat to low or whatever setting keeps the beans simmering throughout the cooking process. While the lentils are cooking, put the olive oil and the chopped onions in a large saucepan over medium heat. Sauté for 4 to 5 minutes or until the onions are translucent. Stir occasionally. Add all the remaining ingredients to the saucepan except the garnish. Bring to a simmer, cover, and cook for 10 minutes. Add the vegetable mixture to the lentils and cook for another 30 minutes, or until the lentils are tender. (The lentils take about one hour of total cooking time.) Adjust the seasonings. If the soup is too thick, add more broth. (Different varieties of lentils absorb different amounts of liquid.) Ladle the soup into large bowls, garnish, and serve. Variations: Add a dollop of sour cream or yogurt to each bowl. Sprinkle the soup with a small amount of grated orange peel. Substitute chopped chives or cilantro for the parsley. For a meaty soup, add one pound of raw lean hamburger or chopped sirloin steak (ideally grass-fed) when you combine the vegetables with the lentils. MR. KOJO NNAMDIFrom WAMU 88.5 at American University in Washington, welcome to "The Kojo Nnamdi Show," connecting your neighborhood with the world on Food Wednesday. The modern American diet is worlds away from the foods our ancestors ate, even basic ingredients like rice, flour, fruits and vegetables have been bred, processed and tinted to look better and last longer in the store. MR. KOJO NNAMDIAnd nutritional value, that's a distant consideration if it's a consideration at all. Meanwhile, the wilder cousins of the food we eat might have 10, 20, 100 times the nutritional value including super foods like quinoa, arugula and multi-colored corn, to name just a few. MR. KOJO NNAMDIBut these ancient dietary staples are making a comeback in new recipes that combine taste and nutrition. Joining us to talk about this is Maria Speck. She is the author of "Ancient Grains for Modern Meals: Mediterranean Whole Grain Recipes for Barley, Farro, Kamut, Polenta, Wheat Berries and More." MR. KOJO NNAMDIShe joins us from studios at MIT in Cambridge. Maria Speck, thank you for joining us. MS. MARIA SPECKThank you so much for having me. NNAMDIThis is Maria's first cookbook. It won the Julia Child Award, was a New York Times Notable Cookbook as well as a Washington Post top 10 cookbook. Joining us by phone from Vashon Island off the coast of Seattle is Jo Robinson. NNAMDIShe is a health writer and activist. She's the author most recently of "Eating on the Wild Side: The Missing Link to Optimum Health." Thank you so much for joining us, Jo Robinson. MS. JO ROBINSONI'm happy to talk with you. NNAMDIAnd you'll be happy to know that our in-studio guest, Lydia DePillis, used to hang out on Vashon Island. She's now a reporter with The Washington Post for, a reporter for Wonkblog with "The Washington Post. Why did you use to hang out on Vashon Island? MS. LYDIA DEPILLISI grew up in Seattle and went to camp on Vashon every summer. NNAMDIThere you go. That's why you're so familiar with it. If you'd like to join this conversation, do you cook with ancient grains, farro, barley, quinoa, wheat berries, call us, 800-433-8850. NNAMDIMaria, you're an advocate and evangelist some would say for whole grains in cereal but in general but in particular ancient grains. What grains are we talking about? SPECKWe're talking about, for example, some of the ancient wheats that are having a comeback. Farro, I believe you mentioned earlier is one of them. Kamut is another wonderful one with a rich buttery flavor that I cherish. Spelt is another one, very popular in German speaking countries until the early 20th century. SPECKI'm half German and half Greek so obviously I'm familiar with spelt and I love spelt and so these are some of the ancient wheats. Then you mentioned quinoa, super trendy right now but there's, you know, many others that I also cherish and that I would love to, see, you know, really more prominently on our plates such as millet and buckwheat and even byre, whole rye berries are deliciously tangy and wonderful as a whole grain. NNAMDILydia, quinoa has a bit of special history. Tell us about it and where it comes from. DEPILLISSure. So quinoa actually did grow in North America a couple of millennia ago, but didn't take off in agriculture in the U.S. Rather corn and rice and beans did. So instead it started to be grown or it actually has been for millennia before that in the High Andes of South America. DEPILLISPeru, Ecuador and there it was simply, it was basically the poor people's food. It grew in the high mountains and people ate what they grew and it wasn't so much a staple of the high classes. But over the past even few years it's become tremendously popular in the U.S. and around the world. DEPILLISAnd as Maria mentioned it's quite trendy. I don't know what it is about quinoa that's just become this cultural touchstone but its demand is off the charts. NNAMDIWe'll get into the global economics behind quinoa, but first a little more about what makes it special. Jo Robinson, quinoa is an example of what some call a super food. What's it got? ROBINSONQuinoa, interestingly, was gathered by hunter gatherers people who lived on wild food before we invented agriculture. And it was one of the few seeds and grains in their diet and it was important in many cultures and it's much higher in protein than other kinds of seeds and grains that we eat today. NNAMDIJo Robinson is a health writer and activist. She joins us by phone from Vashon an island off the coast of Seattle. She's the author most recently of "Eating on the Wild Side: The Missing Link to Optimum Health. If you'd like to join the conversation, give us a call at 800-433-8850. NNAMDIAlso joining us is Maria Speck, author of "Ancient Modern Meals: Mediterranean Whole Grain Recipes for Barley, Farro, Kamut, Polenta, Wheat Berries and More." And Lydia DePillis is a reporter for Wonkblog with "The Washington Post." NNAMDIHave you thought about cooking with whole grains, but just don't know what to do with them? Give us a call, 800-433-8850. Jo Robinson, let's talk a little bit how about we got here. Your most recent book is about what's happened to our food over generations. What have we done to it? ROBINSONYou know, most of us today have been focused on what we've done to our food in the last 50 or 100 years and the mantra right now is eat what your grandparents ate, what your great-grandparents ate. ROBINSONAnd my research shows that to get the food that is really ideally suited for our health we need to go back 400 generations not just two or three to find food that is the richest and antioxidant in fiber and the lowest in sugar boosting, you know, readily digested starches and sugars. ROBINSONWe didn't invent any food. We've never created a seed that can grow into a plant but what we have done is we've adapted wild plants starting 12,000 years ago and what we now know is that we were fashioning them to make them taste better to us, to be more productive, easier to prepare. ROBINSONSo even 5,000 years ago we had lost a lot of nutrition from our food and I've been looking at what we've lost but just as important which modern varieties of fruits and vegetables have held on to these wild nutrients and how we can find them in supermarkets and farmers' markets and seed catalogs. So the new research is showing what we've lost but also how we can bring it back. NNAMDIYou say, Jo, it's not enough that a food be local, organic or heirloom. Why not? ROBINSONBecause those choices have very little to do with the individual nutrients of a plant. It turns out that the plant's genetics is what matters the most. Not how you grow it or how close it is to your home. So you can grow a low nutrient fruit or vegetable, Golden Delicious apple, is an example. It's an heirloom. ROBINSONIt can be growing, you know, in your backyard but the Golden Delicious is not all that good for us. In fact, a study showed that overweight men who were given a Golden Delicious apple a day had increased triglycerides and LDL cholesterol after two months. So an apple a day didn't keep the doctor away because it was the wrong variety. NNAMDIAnd getting a certain number of servings of fruits and vegetables a day is in the recommendation of our own USDA's food pyramid now known as My Food Plate, perhaps is not the best way to serve your health. Can you explain Jo? ROBINSONYes, it's not the amount of fruits and vegetables you eat, it's the variety. It's which select ones you choose. Some examples, if you choose a red grapefruit you can lower your triglycerides. A white grapefruit won't do that. ROBINSONIf you pick white-fleshed peaches and nectarines, and this is a surprise, you can get six times more antioxidants than if you were to choose a yellow fleshed one. So its choose this not that that's really going to improve our health. NNAMDILydia, given the average American's diet, you would push back somewhat and say never mind the heirloom tomatoes any fruits and vegetables are, well, a good start. DEPILLISI certainly wouldn't dispute Jo's point that there's, I'm sure, more and less healthy fruits and vegetables for you. But what I worry about that from a messaging standpoint is that there vast swathes of America that eat none at all. DEPILLISAnd so to tell them that, well, if you eat this kind, it actually won't help you as much as that kind, it could complicate the campaign and just make people throw out their hands and say, well, I might as well just eat Twinkies because if an apple's not going to be good for me, then it's, you know, Twinkies are better anyway. NNAMDII guess, Jo, your point is that if you want to get the most from the fruits and vegetables that you do eat, you may have to pay attention to the type you're choosing. ROBINSONYes, and I hear you, Lydia, about worrying that, you know, this is just another complicated message for people. What my experience shows that there's a significant percentage of the population that is really eager for this information. ROBINSONThey're ready for it, they're excited about learning exactly what to pick in the store and gardeners, too. You know, the seed catalogs don't tell you anything about the nutritional of what you're planting. But the varieties that I recommend for gardeners it can really improve their health. ROBINSONThey can lower your cholesterol, they can lower your blood pressure, reduce your risk of glaucoma. All of these are significant diseases and randomized clinical studies show that these effects are measurable and significant. ROBINSONNow, I think that this movement is going to start with people who are already very interested in health and trying for optimum health. It's not going to start, you know, these supermarkets in the middle of, you know, urban low-income areas. ROBINSONBut I have seen other movements start with a small population of people and then increase and grow so that, you know, there's 8,000 farmers' markets now and farmer people who bring their fruits and vegetables to farmers' markets are very interested in growing the most nutritious varieties. ROBINSONSo I see that, you know, in the future and I'm hoping within 10 years even major food producers will be focusing on these extra nutritious varieties so that the ones that are available in the supermarket. ROBINSONIt doesn't -- people aren't going to have to shop by a list which you do have to do right now. They can just pick things they like and they'll be better for them. So I see this as a trend that is just beginning that can really mushroom. NNAMDIA trend that become a movement. Maria Speck, many of the basic grains you talk about have been overlooked by consumers for a variety of reasons. Why do people avoid cooking with them? SPECKWell it actually fits really nicely into the discussion right now because one of the issues I love, you know, grains, whole grains or ancient grains how we now call them are obviously very healthy. SPECKThey have many nutrients. I call them nutrimental powerhouses but the main issue for me is really to provide people with, you know, mouth-watering food and that's something when we talk about health we all want to eat health but if, you know, a dish has been so healthified, which is some dishes that I've eaten in the past then you might never eat a bowl, you know, for example, of wheat berries again. SPECKSo in my book, I try to really introduce people to food that is mouthwatering prepared with whole grains and I'm actually, I would like to briefly also reply to Jo's point. Some of the things she mentioned in an article in "The New York Times" a couple of months ago are actually in traditional Greek cooking and I was raised by a Greek mother so they're very familiar to me. SPECKThey're commonly used and even to this day, like, a lot of herbs we use also in my book. I mean, my mother uses herbs by the fistful, not by the teaspoon. SPECKAnd a few years ago in the U.S., the recipes that I saw, they were all having, you know, one teaspoon of this and one -- and I'm like no, you can actually put a cup of herbs into a lamb burger, right? And this is traditionally done. This is not something that I have invented. My recipes are inspired by, you know, lots of different traditions across the Mediterranean. Many, of course, also by Greek because of my mom, like Greek recipes. SPECKBut -- so this is something I think we always have to keep in mind. When we talk about healthy food that's great but we have to really provide people also with recipes, you know, where they really want to have dishes. For example, one of the great -- now when summer is ending, you know, I have a farro dish in my book that's a creamy farro dish with honey-roasted grapes for example as a warming breakfast for late summer or early fall. It's wonderful. You can get a farmer's -- it tastes especially good with farmer's market grapes which are often very flavorful and smaller. SPECKAnd so these are the things I think that we have to keep in mind to really help people make good choices. NNAMDIGot to take a short break. When we come back, we'll continue our conversation on ancient grains and wild greens. You can continue to call. If you have already we'll get to your calls. If you're thinking about calling the number's 800-433-8850. Did you know that some varieties of fruit and vegetables are far more nutritious than others? You can send email to kojo@wamu.org or send us a Tweet at kojoshow. You can go to our website, kojoshow.org and ask a question or make a comment there. I'm Kojo Nnamdi. NNAMDIWelcome back to our Food Wednesday conversation on ancient grains and wild greens. We're talking with Lydia DePillis. She's a reporter for want blog with the Washington Post. Marie Speck is the author of "Ancient Grains for Modern Meals: Mediterranean Whole Grain Recipes for Barley, Farro, Kamut, Palenta, Wheat Berries and More." And Jo Robinson is a health writer and activist. She's the author most recently of "Eating on the Wild Side: The Missing Link to Optimum Health." NNAMDIWe're taking your calls at 800-433-8850. I'll go to Patricia in Rockville, Md. first. Patricia, you're on the air. Go ahead, please. NNAMDIYou're breaking up on us, Patricia. You're -- we're not hearing you very well but we heard enough that you're from Bolivia and you say that quinoa is also grown in Bolivia. And, you know, many of the basic grains that Marie talked about have been overlooked by consumers for a variety of reasons. But in terms of cost, Lydia, quinoa might be the big exception here. The price of quinoa has tripled in the past five years. Most of the grains that Maria was talking about, you can get fairly cheaply in health food stores. Not so quinoa. What's going on? DEPILLISYeah, so quinoa just has spread like wildfire. It started being distributed through big super markets like Whole Foods and Trader Joes. And for a while those growers in Bolivia and Peru could handle the demand. But they're starting to run out of land to grow it on and there's a big of a blockage in the U.S. It has pretty high start-up costs. You need expensive equipment to process it on. And you need farmers who are interested enough to spend the time tinkering, because it's not the easiest thing, especially in different climates. So there's a little bit of a supply jam and the price is adjusted accordingly. NNAMDIMore than 90 percent of quinoa is imported from the Andean region, but given the demand for this quote unquote "super food," many researchers and farmers here in the U.S. and elsewhere would like to grow it, but it's not that easy. What's so special about growing quinoa? DEPILLISSo quinoa only grows in places similar to the high Andes, which in the U.S. correspond to Colorado and some pieces of the Pacific Northwest. And it's not like we have a lack of land but it's not the great plains where you have plenty of big agricultural interests who are used to growing the things that we eat every day. So there's a small core of people working really quickly to try to develop varieties that can grow -- that are more versatile. And that's happening all over the world. DEPILLISAnd so it's only a matter of time before we have the kinds of quinoa that aren't as finicky and won't fall to pest infestation or a quick freeze. But we're not quite there yet. NNAMDIHow about the challenge of processing it? It's my understanding that that's fairly intensive. DEPILLISYeah, you have to wash it and it comes with this sort of gritty exterior. And so you have to break it down a lot. And that's why when you throw quinoa in a pot and boil it, it only takes 15 minutes. But that's because it's already gone through a lot of processing. NNAMDIHow about the Andean farmers that have grown it for so many generations, how are they staying in the game so to speak as quinoa goes global? DEPILLISSo they've modernized and have used that high price premium to invest in their farms. And they also have -- it's a lot of small farmers that are gathered together in collectives. So, you know, they're familial in their communities. And it's also heavily supported by, in particular, the Bolivian government, which knows what it has as a natural resource and considers it also a patriotic kind of export. And it's the international year of quinoa, in fact. So that's raised awareness. DEPILLISBut they're trying to stay in the game and they're trying to do it by preserving the identity of Andean quinoa as something special and better for you and better tasting. And it's the real deal like Bordeaux from Bordeaux, France or whatever. So that's how they're hoping to lock in those profits, even as quinoa goes global. NNAMDIMaria Speck, I don't know if you wanted to join in on this quinoa conversation. SPECKI would love to because I do think we have a lot of other wonderful and equally quick cooking grains. And that's something that's often overlooked. People think of grains as slow and taking forever to cook. And, yes, that's true for some of them, for example, whole wheat berries. They need soaking and cooking. But there is what I call quick-cooking grains and there's many that are on your table in 15 minutes, even on a super busy week night, such as I've mentioned buckwheat. There's bulgur. That's something that I love. NNAMDIAnd now your secret's out, though. SPECKThat's all right with me. Three's a ricotta lemon pudding with warm raspberry sauce. I mean, people never guess the secret ingredient and love it. And so, I mean, we have to really also just think broader. We have -- I think it's good if it -- quinoa, I love that again, but I think the variety on our plate is just the variety of grains. It's equally, you know, wonderful because it's boring to always eat the same, you know, brown rice, for example. I also -- I love brown rice but there's many other kinds of brown rice. SPECKThere is, for example, Chinese black rice which cooks a stunning purple and which is really so beautiful when you serve it. I have a dessert again in the book but you can also serve it in savory dishes. The dessert is a purple rice pudding with rosewater macerated dates for example. And that's -- I mean, it's just so mesmerizing. It's a self texture. It's not at all chewy so it's comforting and mouthwatering delicious. NNAMDIYou know, Jo Robinson, a lot of what Marie describes sounds so delicious but many people would say that our supermarket produce today does not have a lot of flavor. So how did we manage not only to lose so much nutrition but also flavor? ROBINSONIt has to do with our present system of growing foods in large mega farms in California and Florida and then shipping them around the country, storing them in warehouses. And then they eventually get to the super market and some of them have lost most of their nutrients by the time we buy them. Even though we think we're buying fresh produce, it might be two or three weeks or six months old. And this is really important when it comes to some of the fruits and vegetables that we eat, in fact, the ones that we consider the most important. NNAMDIBroccoli would be one such example? ROBINSONYes, broccoli is one, asparagus, arugula, cherries, kale, lettuce, raspberries, spinach and strawberries. Now these are things that are excellent for us, but if they've been on the slow train from California for a very long -- you know, for weeks, there's not a lot left for us. And this is a strong argument for growing food locally and having more regional distribution, which is something I believe we need to do for a variety of reasons. NNAMDIYou know, I think Mary Jo in Frederick, Md. is calling to, well, agree with you. Mary Jo. MARY JOYes. I just was wondering if there was any delusion in nutritional value. We just notice a difference in taste when we purchase the quinoa from let's say a grocery store versus in a health store and just with the popularity of it and perhaps the over production of it, what are we? And one of the reasons that we are eating quinoa is supposedly for the health value. And I'm wondering if we're losing that. NNAMDIAnd you've noticed a difference in flavor depending on where you buy your quinoa? NNAMDIDo you know anything about that, Lydia DePillis? DEPILLISI don't. Considering that it's true, as the previous caller mentioned, 95 percent of our quinoa comes from Peru and Bolivia in small scale farming. So there is no agribusiness when it comes to quinoa, so I don't know why that would be the case. ROBINSONYeah, you know, the local farmers and local production is likely to have richer soil, which really influences the flavor of food and the nutrients. So, you know -- and it's likely to be fresher. And everything is better fresher. So I -- it really makes sense that the food that you buy in places that, you know, get from local supplies, organic food is going to taste a lot better. NNAMDIMary Jo, thank you very much for your call. I don't know how that would apply to quinoa, but let's move on to Lauren in Fairfax, Va. Lauren, your turn. LAURENHi there. Thank you so much for taking my call. I just wanted to say that -- two things. One, that this conversation about quinoa and ancient grains is really wonderful for my point in my life -- this point in my life right now. A friend recommended I look into the Weston A. Price Foundation to look at Wise Traditions. I'm sure you guys are familiar with that. But, you know, of course they recommend ancient grains and how to prepare them and I'm learning. You know, it is -- they are so tasty compared to your normal grains. LAURENI'm also a personal trainer and health and wellness coach. And, you know, people -- and they always say, I don't want to give up carbs. And it's like, you know, what you were saying that this is the time. People don't want to give up carbs and they don't have to when they have these ancient grains that are, you know, becoming more popular and more readily available. So thank you for having this kind of conversation and putting me on the air. NNAMDIOkay. Thank you very much for your call. We move on to Enrique in Arlington, Va. Enrique, you're on the air. Go ahead, please. ENRIQUEHi, how are you. Thank you for taking my call. I just want to share with you my experience of two delicious foods. I'm from Bolivia and I enjoyed those in the '50s and '60s growing up in Bolivia, and of course more recently my recent travels. And that is, you know, quinoa in the form of soup made with a few veggies, diced potatoes, diced carrots and cooked perhaps with lamb. It makes a delicious soup with some parsley on top of it. ENRIQUESecondly, also enjoyed it in the form of dessert, which was quinoa cooked -- first it was browned lightly and then cooked with water until the water is totally absorbed and served, you know, cold with some sprinkled cinnamon and maybe a little bit of brown sugar. This would be kind of a midday snack, something like that. Both dishes are enjoyed by both Indians and young Indians in Bolivia for many years of course and probably decades. NNAMDIOkay. Thank you very much for sharing those with us, Enrique. And Maria, we got an email from Dan in Bethesda who says, which of the appealing grains you're discussing besides quinoa are gluten free? SPECKOh, that's such a great question because that obviously is another big and almost separate topic. You know, all the issues that we've had in the past decades and still growing. People either having celiac disease, which is obviously very challenging for them because they cannot have any gluten at all, which as in wheat or rye or barley. But for people that are concerned and have, you know, issues with gluten, they can have many grains. There's many, such as amaranth, buckwheat, corn, millet, oats if processed correctly, quinoa of course, rice and also wild rice. So there's many grains that you can have. SPECKAnd another interesting aspect about -- you know, so we have people with celiac disease but there's also people that have sensitivities with gluten. So they have, like, discomfort in different stages. And what's interesting, what I've learned from a lot of readers is that, for example, some of the ancient wheats, such as farro, smelt and kamut, do not -- with some people -- they work for some people either when they have them in a bread or when they have them even as the whole grain. SPECKSo that's an interesting thing. People are researching enough because they're trying to find out what happened, you know, with modern day wheat. And there's a lot of people working on that right now to help us understand better. NNAMDIAnd, Maria, we got an email from Mike in (word?) who says, "I'd like to cook with whole grain millet more often if I could find it. Where does millet come from? What are the advantages of using it in cooking?" SPECKWell, millet is actually a grain. Millet is -- some say maybe made the first pasta, I think, 4,000 years ago. Like we found a pasta that was 4,000 years old in China. And so which is interesting because it doesn't have gluten. So how did they make pasta strands that were, I believe from my recollection, a yard long, which is quite something. And they were preserved like that. And so some say the Chinese made the first pasta. SPECKAnd, yeah, so millet is still a staple of course in Africa. It's a staple in northern China and in India of course also. I had wonderful millet when working in India. And you can find it -- you can find it in health food stores. You can find it -- it's becoming more easily available but I think right now your best bet is still a health food store. NNAMDIJo Robinson, we got an email from Katy who said, "I wanted to let you know that my son eats dandelions right out of the yard. I've warned him not to eat them any other place because I don't know what chemicals get sprayed on them. However, in our yard he eats and we pick the leaves and he also eats the flowers too." So the art of eating dandelions is not completely lost, Jo Robinson. ROBINSONRight. And, you know, that's a good comparison between wild greens and our modern ones, that we consider spinach a super food, but dandelion greens have twice as much calcium, three times as much vitamin A, five times more vitamin K and E and eight times more antioxidants. This is an example of what we used to eat versus what we eat now. Even our super foods would not -- do not hold a candle to wild foods. NNAMDIIt's our Food Wednesday conversation on ancient greens and wild grain -- wild greens. And Lydia DePillis, it is not entirely a quinoa love fest, but let's circle back to quinoa for a second because soybeans are an example of a crop that once was not grown much here, but it became popular. Now there's tofu in every supermarket, and the crop is ubiquitous. Do you see any perils with the future of quinoa? DEPILLISIt's different. I mean, soybeans have actually been grown in the U.S. for about a century, and they started at a time when we still had mostly small scale farms. So they scaled up in particular around World War II when the supply from China, when then had been the primary supplier dried up, obviously, and then research quickly developed to show that it was useful for a zillion different things. For running cars, for making plastic, for feeding chickens, and now we think of it as being in milk and tofu, but I think that's probably a very small use of soybeans in the U.S. right now. NNAMDIGot to take a short break. If you have called, stay on the line. We'll try to get to your calls on this Food Wednesday conversations on ancient grains and wild greens, and you can also send us email to kojo@wamu.org. Have you thought about cooking with whole grains, but just don't know what to do with them? You can also go to our website kojoshow.org and join the conversation there. I'm Kojo Nnamdi. NNAMDIWelcome back. We're talking with Jo Robinson. She's a health writer and activist, author most recently of "Eating on the Wild Side: The Missing Link to Optimum Health." Lydia DePillis is a reporter for Wonkblog with the Washington Post, and Maria Speck is the author of the book "Ancient Grains for Modern Meals: Mediterranean Whole Grain Recipes for Barley, Farro, Kamut, Polenta, Wheat Berries, and More." This, her first cookbook was is what won her the Julia Child Award. It was a New York Times notable cookbook as well as a Washington Post Top 10 cookbook. NNAMDIJo Robinson, in your book, and in an article in the New York Times recently that got a lot of attention, you write about foods whose wild ancestors have far more nutrients than their modern cousins. Corn is one example. Can you talk about the sweet corn we eat or what it has in common with its wild predecessors? ROBINSONWell, very little. Wild corn is about two percent sugar and 30 percent protein, and the super sweet corn we eat now, 95 percent of the corn we eat is super sweet varieties, is two percent protein and up to 40 percent sugar. That's enough sugar to raise your blood sugar as much as eating a Snickers bar. So we've literally created candy corn, and this is process that we've been working on for about 300 years, starting with our first discovery of sweet corn, and then our discovery of super sweet corn. ROBINSONIn the 1950s, researchers found a mutant corn that had -- could produce 10 times as much sugar as what we have now, and that's the ancestors of the corn in our supermarket. Throughout history, if we found something that's sweeter, we've chosen it. Our brains tell us to eat more sugar even though we're in a land where we're just inundated with it. But we still get these feel good chemicals in our brain when we eat it. So this is true for many of our fruits and vegetables. They're much sweeter and less good for us than ones that we ate in earlier generations. NNAMDIWell, it's interesting. We combine multicolored corn, also known as Indian corn, to hang on our door as a decoration in the fall, but not to eat. So how does one get the benefits of something like multicolored corn? ROBINSONYeah. What multicolored corn has to offer is far more antioxidants and some important ones like anthocyanins that you find in blueberries and blackberries, and this was the corn that everybody ate until about 1820. And with that corn, you don't eat it fresh, you let it mature and then dry it and use it as cornmeal, and we can still get that cornmeal today. In my book I have a recipe for purple cornbread that's delicious. You can find it in a health food store or on the Internet, both purple, blue, and red cornmeal, and that brings back those nutrients that we unwittingly bred out of one of our favorite vegetables. NNAMDISo does that mean I should go for the blue corn chips in the supermarket? ROBINSONWell, you know, I wish I could say yes, but the processes that they use to make the corn chips gets rid of about 70 percent of those good anthocyanins. It's a little better for you, but it's not what it could be. NNAMDIOn to Pam in Silver Spring, Md. Pam, your turn. PAMI was wondering if it was at all practical in this very moderate climate to try and grow any of things yourself in your backyard garden if you have sunlight and everything. NNAMDIWhat do you know about that Jo Robinson? ROBINSONOh, yes. Everything that I recommend can be grown in home gardens. Not in every -- everything can't be grown in every region, but, you know, wherever you live, you can be growing some of these (word?) food which have a real potential to increase your odds of enjoying optimum health and fighting disease. NNAMDIOkay. Thank you very much for your call. We move onto Dennis in Front Royal, Va. Dennis, you're on the air. Go ahead, please. DENNISHi, thank you. A quick question. I hope I'm not duplicating somebody's earlier -- an earlier question. I just got hold of the show now. While the ancient grains and that possess better qualities than what we have today, are those qualities not diminished by the fact that we chemically treat our soil to make production go higher, or are the people who are raising those grains, are they using a better process for improving the soil, in other words, a more natural process instead of chemically. And I'll wait for my answer off the air. NNAMDIJo Robinson or -- and then Maria. ROBINSONYes. Yeah. Let's have Maria answer that one. ROBINSONYeah. I have some comments also. SPECKWell, I'm basically a promoter, if you really love whole grains as much as I do, I always like to buy organic because obviously in this case you do eat the whole kernel, so including the outer bran as well as the germ. That's why it's called a whole grain, and so I prefer that. And given, you know, that, yes, organic is more expensive, but with grains it goes really a long way. That's the beauty of grains. A pound of wheat berries will make a number of meals, I'm pretty sure even in a larger family. And so that's something that I prefer, personally. It's a personal choice. NNAMDIThank you very much for your call. Lydia, you're working on a piece about how specialty foods make it onto our grocery store shelves, so how might some of these ancient grains become staples again? DEPILLISSo the -- I spent more time thinking about the other side of -- other end of the supply chain than Jo and Maria, and right now it's a story about a gigantic Hispanic food producer, Goya, and that is -- they produce lots of foods that we see around us all the time, garbanzo beans, black beans, but also some of the things that Latin American communities use in their traditional cuisines. And so they will serve local ethnic markets with those -- like a huitlacoche or something. DEPILLISBut they have them available to the bigger supermarkets, so if a Giant Foods thinks it's perhaps of interest to its more general audience then they'll bring it in. But just like natural foods and gluten-free foods, they're often segmented in their own special aisles. But if they are selling well, eventually the people who set up the store floors will put them in the general category of flours or of beans as well as the ethnic or the natural food aisle. And so they'll be in two places, but they'll be playing to two totally different audiences. NNAMDIOnto Mae in Fairfax, Va. Hi, Mae. MAE(unintelligible) I really appreciate your program. I'm calling about two things. One of them is a grain called bulgur wheat that we got as children as a porridge in Jamaica. MAEWe had bulgur wheat porridge, corn meal porridge, and (unintelligible) . All babies and old people got them to eat and they kept healthy. NNAMDIMaria, speak to the issue of bulgur. SPECKThat's really wonderful. I'm so glad you brought that up, because I think -- I love bulgur, and it's obviously also used widely across the whole Mediterranean and, you know, some people call it ancient fast food. It's really, truly wonderful, and it's even -- if you're too lazy to cook, you can still have bulgur because it is already parboiled. It's then dried and cracked and so just need to -- you could even just put some, you know, warm or hot water onto a cup of bulgur and just wait and then you can use it in a salad, and just on a hot summer day there is no other cooking involved. SPECKYou don't need to turn on the stove. It's extremely nutritious, it's fiber rich and has more fiber than quinoa and oats and it's also very tasty. I have for example a side dish is bulgur with butter roasted almonds cinnamon and a hint of cayenne, which is ready in 15 minutes, and it's great for a grill party, and that's one dish that I love and often make really last minute. So thanks for bringing that up. I love that you ate that in, I believe, Jamaica, is that right? SPECKWonderful. I love that. I didn't know that. That's so great. SPECKSomething I learned. Something I learned. Thank you so much. MAEAt one time the even gave it out at school to school children, but I did (unintelligible) until the last 20 years myself. NNAMDISee, that's probably what Usain Bolt grew up on, but that's a whole nother discussion. Thank you very much for your call, Mae. Maria, another big reason people avoid cooking with some of the foods we've talked about including whole grains is taste, and taste is something that you emphasize a lot. There are a lot of recipes in your cookbook that are -- well, frankly, mouth watering. Your first rule seems to be do not skimp on taste. SPECKYes. And my other rule is, especially if you have children, to never ever say healthy. I know Jo might not want to hear that, but it's really something that, you know, all the recipes in my book I've cooked for children and they have eaten everything. And there were parents that say no, my kids they don't eat spelt pizza, and no, my kids don't eat this and they don't eat this, and yes, they will, but I never ever use the word healthy. And I feel very, very strongly about it. Not because I don't like that the food is healthy. Obviously, I care, you know, deeply about that. SPECKBut I really think, you know, food is about so much more and that's what, you know, we have to really try people to also -- what I tried with my book also was to explain that every grain actually has a flavor. That's something we have also, you know, many of us maybe have never experienced, right? I mentioned rye berries have a slight tang. Bulgur has a rich, nuttiness. Quinoa, of course, is mild grassiness. Millet is extremely mild and versatile. It can be used in a million things, which is wonderful. I think it makes it a great. quick-cooking grain. SPECKOats, of course we all love oats. Sorry. Yeah. So, you know, so I can go on and on. I'm sorry. NNAMDIYeah. I was about to say, Jo, your focus is on nutrition and health, and you would say that butter, cream, eggs, and meat in moderation can fit into a healthy diet. You did a lot of research on this, but all animal products are not created equal. Can you explain? ROBINSONYes, absolutely. When we took our animals off of pasture and put them in feed lots where there's nothing to eat, and they have to walk around in their own excrement, et cetera, and then began to feed them grain, which is totally foreign to the diet of these grazers, we really reduced the nutrient content of that meat. The feed lot meat, which is everything in the supermarket, unless it says grass fed, is lower in Omega 3 fatty acids. People know about the health benefits of those. ROBINSONIt's higher in anti -- it's lower in antioxidants, and it's higher in fats that are pro-inflammatory. But if we eat grass-fed products, they're lower in total fat, lower in the kind of fats that increase the risk of blood pressure, and they're full of these nutrients which is how the used to be, and it's, you know, our health benefits, if we would choose this healthier more ancient way of raising animals. SPECK...to add something to this, Kojo. SPECKBasically, that's a very good point that Jo is making, because the other thing that comes into it is I also, you know, I love to eat meat, but I tend to use small portions of good quality meat, which, you know, as Jo explained also, tends to have better health properties for us, and then basically my plate will have grains and vegetables. And so the meat and the fish portion will be much smaller, and that's something that I also think, you know, which is more of a traditional plate, and you have this across cultures that meat and fish were special. SPECKAnd we know also from the oceans, how we're emptying the oceans, and all of this, I think is part of a more, you know, balanced plate that's better for us, that's better for the planet, and of course, you know, it can phenomenally well. NNAMDIAnd finally, Lydia DePillis, if some people think that the foods we are talking about are perhaps too much in the health food department and not their thing, I guess we should remember that at one time the only bread you could get in the supermarket was white bread. Now there's whole grain everything and tofu in every supermarket. DEPILLISYeah. It's actually, I think, it's important to remember that we now have more choice than we probably used to, and so not all is doom and gloom when it comes to mainstream America's food choices. NNAMDIAncient grains and wild greens may be coming soon to a supermarket near you. I'm afraid that's all the time we have. Lydia DePillis is a reporter for Wonkblog with the Washington Post. Lydia, good to see you. Thank you for joining us. NNAMDIJo Robinson is a health writer and activist. She's the author most recently of "Eating on the Wild Side: The Missing Link to Optimum Health." Jo Robinson, thank you for joining us. ROBINSONI was happy to do it. NNAMDIAnd Maria Speck is the author of "Ancient Grains for Modern Meals: Mediterranean Whole Grain Recipes for Barley, Farro, Kamut, Polenta, Wheat Berries, and More." Maria Speck, thank you for joining us. SPECKThank you so much, Kojo. It was great fun. NNAMDI"The Kojo Nnamdi Show" is produced by Michael Martinez, Ingalisa Schrobsdorff, Tayla Burney, Kathy Goldgeier, Elizabeth Weinstein, and Stephannie Stokes. Brendan Sweeney is the managing producer. Our engineer, Tobey Schreiner. Natalie Yuravlivker is on the phones. Podcasts of all shows, audio archives, CDs and free transcripts are available at our website, kojoshow.org. Thank you all for listening. I'm Kojo Nnamdi.